It’s always funny listening to the BBC report on Spain’s economic problems, because the discussion invariably comes back to the underground economy, and the host of the show invariably has to pause to explain the whole concept of the underground economy to the listeners. Well, for those of you who are uninitiated, the underground economy is everything that happens “off the books” — all the untaxed cash transactions that keep the money flowing in Spain. 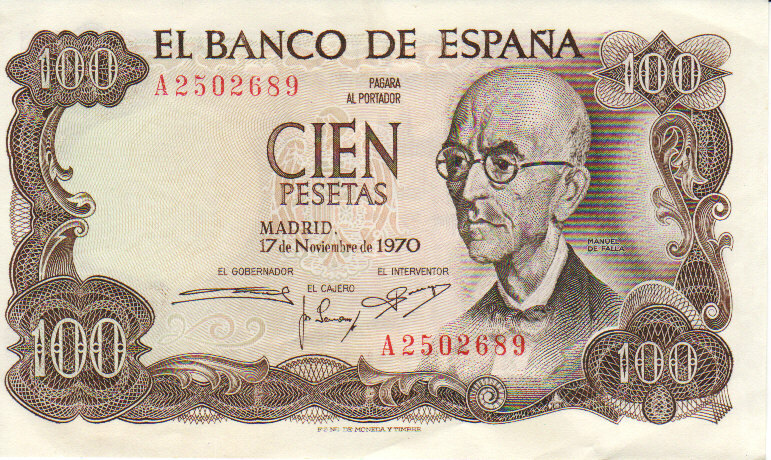 Manuel de Falla, an important Spanish composer, appears on this 100 peseta note from 1970. How big is the underground economy in Spain? Nobody really knows! My personal and largely anecdotal experience leads me to believe that anybody who runs or works for a small business is doing part of their business under the table. One indication of the size of the underground economy is the statistic mentioned in this article that in 2006, 70% of all money in Spain consisted of 500 euro notes. I’ve been around for almost a decade, and I haven’t seen more than a couple of 500€ notes in that time. I don’t think most people have ever seen one. So where are they? Probably in some mafioso’s house, or some MPs safe deposit box. They’re certainly not being used in regular shops–many places refuse to accept them outright. Some estimates say that up to 20% of the GDP is underground, which means that our official 27% unemployment rate is probably far from realistic. How many people are working under the table at the same time that they’re cashing unemployment checks? I’d like to know! How does the underground economy work? In a lot of ways. The simplest way to avoid paying taxes is not to make receipts for your customers. This happens quite a bit in small businesses. The money goes into the register, but with no receipt the government doesn’t collect VAT. Now that the VAT is a ridiculous 21%, it’s easy to see why. Additionally, if the transaction didn’t officially happen, the shop owner doesn’t have to pay income tax on it. Another way to avoid taxes is in paying your employees. A lot of people are working off contract, or their contract only covers part of what they earn. The rest of their salaries are paid in cash according to a gentlemen’s agreement. Why does this happen? Because the amount of money a business owner has to pay for social security is so high (over 30% in addition to the salary) that hiring people at full price would often be impossible. Cheating the system is incentivized by high taxes and lax inspections. Well, couldn’t the government crack down on tax cheats? Theoretically, yes. But I have a feeling that if they eliminated the underground economy, we would have very little economy left, simply because so many people can barely afford to survive and pay taxes. And in any case, it’s pretty clear that the members of the government are also passing envelopes full of tax-free money around and so they’re not really incentivized to implement stricter controls–if cheating on your taxes becomes impossible, politicians will all have to line up to pay income tax on all the money they have hidden in their mattresses. The New York Times wrote an article about Spain’s underground economy in which a prevalent economist suggested that without it, we would have a violent social upheaval. I tend to agree. If there was no underground economy, virtually everybody I know would be much worse off than they already are, and then what would we do? What experience do you have with the underground economy? Let me know in the comments!